Homeowners and Condominium Associations Tax Prep. if it is not to make life less difficult for each other? If you are seeking a lasting, CFO-type relationship with a trusted financial professional for yourself or your small business, we can help. As an independent financial advisory practice, we are committed to providing our clients with care, competence and loyalty. Our firm provides a wide range of services to our individual and business clients. Because we are relatively small, our clients benefit from our personalized approach and a level of service that many firms are unable to provide. Safeguarding your wealth against catastrophic losses, an extended illness or disability, and identity fraud. For business owners, we also provide strategies to protect their wealth and the value of their businesses. Proper estate planning can be the most effective way to help ensure your ability to provide for the financial health and well-being of your family. It can also reduce or prevent much of the stress that so often occurs when heirs attempt to sort out a family member’s estate. Fulfilling any philanthropic goals you might have and maximizing the effectiveness of your charitable legacy. You have many options when it comes to your financial goals. We encourage you to meet with us to discuss your situation and how we can help you gain confidence in a more secure financial future. The Exploratory Conversation is designed to determine whether our philosophy and process are a good match for what you need from a financial advisor. The Discovery meeting enables us to gather sufficient information to understand your goals, your current situation and everything else we need to know to develop an effective plan and recommendations for you. During our Planning & Recommendations meeting, we review and discuss your draft plan, investment strategy/allocation, and other recommendations, and determine next steps. We may schedule a follow-on meeting where we can resolve any outstanding questions or concerns, and then review and sign documents to open new accounts, transfer assets and implement investment strategy and allocation. Our Welcome & Advanced Planning meeting is designed to provide an overview of the various ways you can access financial reporting and organize your financial information. We may also use this time to introduce a discussion of advanced planning needs that may have been uncovered during our discovery and planning process. Our ongoing Analysis & Progress Review process provides an opportunity to discuss updates to your family, employment and financial situation; discuss potential planning issues and the current economic environment; review your progress toward your goals; and answer any questions you may have. Wealth management goes beyond investment advice. It includes helping you increase cash flows, minimize taxes, protect your assets, and ultimately transfer your wealth to future generations or charities. Protecting what you have achieved in life is a crucial – but often overlooked – component of any successful financial plan. We begin by helping you assess your unique risks. Some risks are best addressed with insurance products, such as life, long-term care, and disability insurance. By paying a premium, you transfer your out-of-pocket risk to the insurance company. 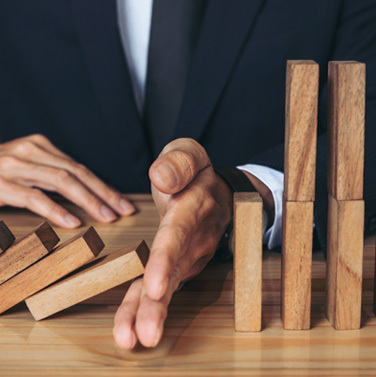 Other risks can be managed through legal means, such as wills, trusts, selecting a type of business entity, and other estate planning solutions. Our business knowledge and understanding of investments and taxation facilitates seamless coordination with your attorney. If you don’t have an established relationship with an attorney, we can assist with the selection process. As we’ve been reminded repeatedly in recent years, navigating financial markets is not an easy task. And the intricacies of building a plan that takes into account investments, estate planning, tax strategies, wealth protection and preservation and other components can make coordinating your financial life even more complicated. We take great care in assembling a team of financial professionals who collaborate with each other to make sure all aspects of your financial life are being addressed. Depending on your needs, we may suggest bringing in other planning professionals, such as a valuation specialist or a charitable giving specialist, to address specific issues. We coordinate each professional’s expertise and incorporate their recommendations into your wealth plan as appropriate. We can also integrate any of your current financial professionals into our team approach. Having your own team of experts working closely together helps increase the effectiveness of your plan and makes sure it stays in sync, with every item properly addressed.